We may have been told at one time or another not to waste our breath. It is actually true at times. We do not have to talk a lot before we are heard. What we need is the right timing. Wait for the best time to speak and when we do, use well-thought out words and speak with a high degree of intelligence. Choose the right audience, the right time, and the best way to say what needs to be said. This includes posting our ideas on the Internet or sending text messages. Likewise, we have to remember that the quality of the words we use is of utmost importance, rather than the quantity of words. People are more likely to listen when we say less. Remaining silent can mean many things. 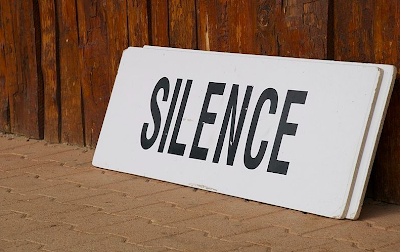 In negotiations, silence of about ten seconds could elicit more information or a higher offer. One- to two-second pauses between sentences give people time to comprehend what one is saying. It is timing and pacing sentences that make every sentence count. People are now conditioned to the noise. There is noise everywhere, from the hum of office equipment, the air conditioning system, the ringing phones, the fax machines, the tapping on keyboards, etc. We could say that silence nowadays is a very rare commodity. Lest we forget, there is also the practice of giving someone the silent treatment. Sometimes it is really needed, because if one does not remain silent, one is bound to say something that he or she might regret later on. Therefore, rather than offending someone and creating more friction, the best thing to do is to remain silent, which in most cases makes one a more refined, educated and an intelligent person. Noisy air conditioning implies it's uneven installation. It's better if you have your ac unit fixed to avoid these problems. Good thing that the dehumidifier we are using here in our home is not producing any too much noise. Now that you’ve mentioned it, I’m quite eager to see the painting that will come out. I must say, painting a full, detailed artwork is quite exhausting. Well written, you give here a lot of valuable tips.